I find it (almost) completely comic to listen not only to the disingenuous comments coming from Federal and State governments, automotive industry figures and commentators regarding Ford’s decision to shed more manufacturing jobs, but also the completely ill-informed comments by the scores of everyday Australians who post comments on media websites about the same subject. Are all these people living in the real world? Do they not understand politics, or simple economics? Ford makes the Falcon, and nobody’s buying it! Falcon, in the eyes of most intelligent people, has been on a precipitous slide for the last eight years. Many times over the past years Falcon was significantly outsold by either the Toyota Corolla or the Mazda 3. Never mind that they are imported, it’s all about size, economy of operation, and relevance for task! If it wasn’t tragic, it would be funny. If only, because either the management team at the Falcon Motor Company of Australia is in denial, or the people who work for them genuinely believe what the company tells them about the possibilities of manufacturing at Broadmeadows and Geelong (oh, and “market forces, outside their control.” - hooey!). Even the Prime Minister as much as acknowledged in interviews in the past few days that manufacturing by Ford Australia will end in 2016. That’s probably the most truthful thing she’s uttered since being catapulted into her current job by the ‘Faceless Men’. My question is: “How will Ford Australia continue to manufacture beyond the end of 2014? 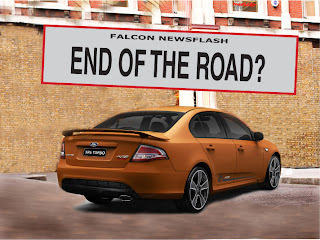 When the next facelifted Falcon is due?” Never mind 2016. Bravest among Aussie motoring journalists,The Australian’s Motoring Editor Philip King has said, in effect: “Ford has distinguished itself by making a lot of bad calls.” He is not wrong. I know that anyone who reads my self-indulgent Blog is well-aware I’ve been calling the whole Falcon mess a travesty for a long time. 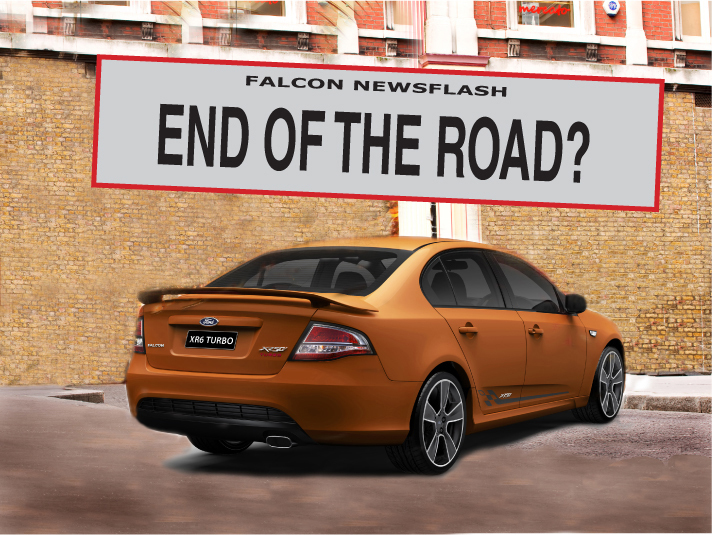 It is almost unbelievable in a business-sense that Ford Australia has gotten away with being in denial for the last decade over the likely future of Falcon, and the apparent lack of planning for a post-Falcon future. But, to express any surprise at this week’s announcement renders the person who made the statement either an idiot or someone who doesn’t understand simple economics - of the “Don’t spend money on a dud” type. Now we have a revelation that the four-cylinder Falcon is not being purchased by some government departments because it fails to meet ‘Green Car’ standards (which were in force before the design was signed-off)?? Can this be any more comic? It’s truly sad that Ford is a major employer of talented and hard-working Australians, and it leaves the families of the workers wondering what is going on? Never mind, that its management thinks it’s protecting its backside with the various governments, suppliers and general community with its disingenuous statements about the state of the market forcing the job cuts. One former Ford Australia CEO who stands out, if only for a heightened sense of self-preservation, is a guy called Bill Osborne, who was parachuted into the Australian job, and handed the poisoned chalice a few CEOs ago. He was a smart man, who obviously figured out what needed to happen, very quickly. I'm guessing he probably said to himself: “I know what has to happen here, and I don’t want to be seen as the architect of the solution, and I don’t want the grief.” He resigned from Ford Motor Company less than a year later, and took a job back in the USA completely out of the motor industry! Ford’s management should at least have the decency to come clean and say: “We’ve been making the wrong calls for the last decade on the future of the company’s manufacturing operations, and we’re sorry." It’s disgusting to think that employees in such a large international company haven’t been confronted with the truth about the failure of its management to scope out a plan which gradually cut back the ‘local’ car production, much like Mitsubishi Motors Australia did. I have nothing but admiration and respect for the last Australian to run MMAL, Rob McIniry. He was a man who, despite the uncomfortable nature of the truth was upfront, believable, transparent and honourable about what needed to happen. It was difficult and I wouldn’t wish that responsibility on anyone, but he carried it off with openess, dignity and honesty. I wish ‘someone’ at Ford had the guts to do the same. I’m very sad to see Falcon disappear. The current car is a GREAT effort by all concerned - designers, engineers, assembly workers and dealers, but it’s misdirected, misinformed and miserable in the end result. 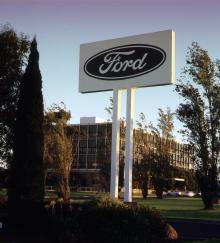 Make no mistake, as a group of dedicated, smart and resourceful employees Ford Australia is truly world-class! Unfortunately, everything has its time in the sun, and its time to fade from view. Falcon has hung on much longer than it should have. If only an astute management had been at the wheel, and guided Ford Australia to a more promising post-Falcon future. I hate writing this stuff, but these management people truly disgust me. They are ultimately responsible for the livelihoods of the employees who turn up every day to do a good job, and they deserve better than ‘death by a thousand cuts’.